I love pretty umbrellas and umbrella motifs in general so when I created this card I wanted to give them all bright colours. I did some masking to get all my umbrellas in amongst each other then watercoloured each one a different colour. I painted the sky first wet into wet then splattered some blue stain over it when it was almost dry but not quite. The umbrella scene is framed in white from the initial taping with masking tape then matted in black and attached to a natural card base. At present I only have a black umbrella but there are such lovely coloured ones as well as the cute ones with paintings and the like on them; I think it is time for a new one. Ideally I’d choose a red raincoat(with polka-dot lining), red boots and a red and white polka-dot umbrella. In actual fact I don’t have any of those things! 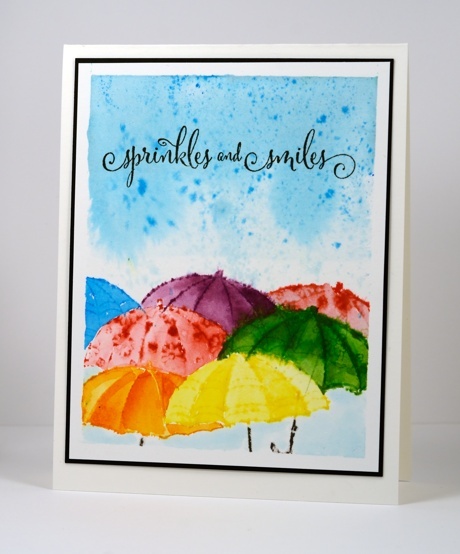 I love this–all the wonderful colors and the texture the splatters created. TFS. What beautiful umbrellas, Heather! My favorite umbrella is bright yellow and my raincoat is white with black and white checked lining. I like to wear flip flops when it rains if it’s not too cold. I am supposed to be planning a Monday Brunch…doing dishes…folding clothes…etc., etc. and yet I couldn’t help but “click” on Bits&Pieces…and so glad I did! 🙂 I think somewhere along the “lines” we must be related somehow! 🙂 I, too, love umbrellas (just ordered yet another umbrella stamp)! There use to be a fabulous store in Astoria, Washington…ALL umbrellas and rain gear! The entire ceiling was cover with hanging umbrellas! I still enjoy the memory in my “minds eye” and wish the store were still in business. Then, there are Polka Dots!…a little girl in my Sunday School class one day remarked to me that I must love polka dots. I answered that I do love polka dots but how did she know that?! She said, “because you wear alot of things with dots!” 🙂 …and yes, red would be my color of choice! Love your watercolour card!!! and now, back to looking for that special recipe for my dear grandbabies brunch! Love you! and God Bless you! Enjoy your brunch and your grandbabies! I had a navy and white polka dot dress as a 10 year old that I loved and I am still searching for a suitable replacement for it! The Monet umbrellas are so lovely; I look at them every time i’m in the gallery store. I haven’t scene a purse sized one though, just the full length. And Winnie the Pooh, delightful.